Kanyadaan is one of the most vital rituals in Hindu Culture, which is performed in conformity to Vedic scriptures. Gift of a girl, the literal meaning of Kanyadaan, signifies the custom in which a girl is gifted by a father to a groom. This ritual is carried out just before the Mangalphere and is considered as a Mahadaan as per the Hindu custom. 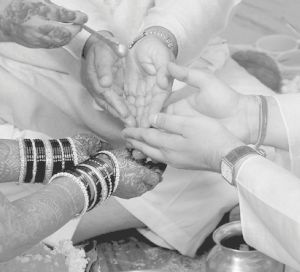 A dutiful act, Kanyadaan is believed to bring fortune and relieve the parents of bride from all the sins. Once the verses are read, the beloved daughter is given away by the parents to the groom and she becomes responsibility of the groom and his family. Kanyadaan is pious as well as an emotional affair in which, the father officially gives away his rights and duties towards his daughter to the groom. In case, the father of bride has expired or is not present at the marriage, due to any unavoidable situation then an elderly relative of the bride can perform the deed of Kanyadaan.